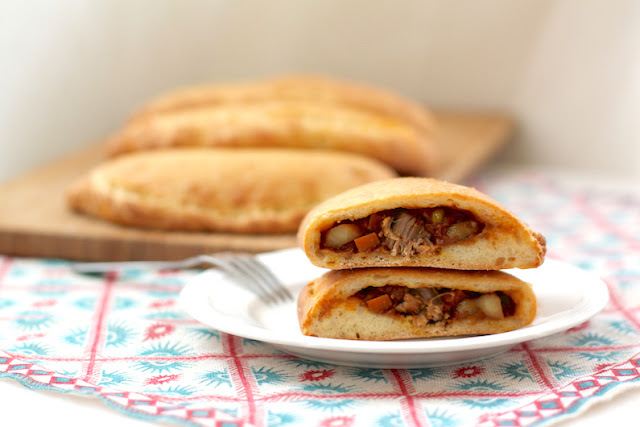 Spicy Beef Curry Calzones feature a thick rich beef curry inside and a soft naan bread outside. They are like eating your curry by scooping it up with naan, but in a less messy, more portable way. 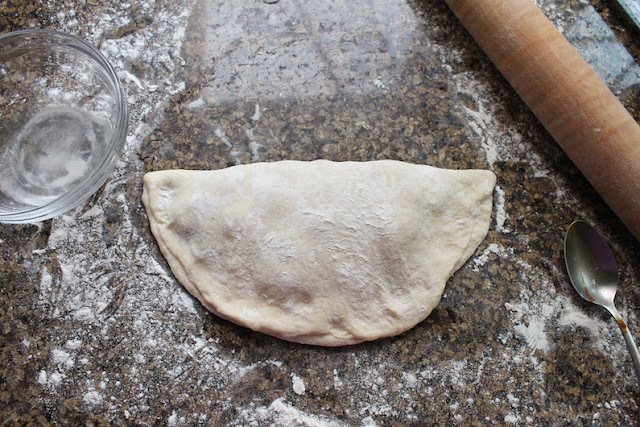 This month our theme for Baking Bloggers is, you might have guessed, calzones. 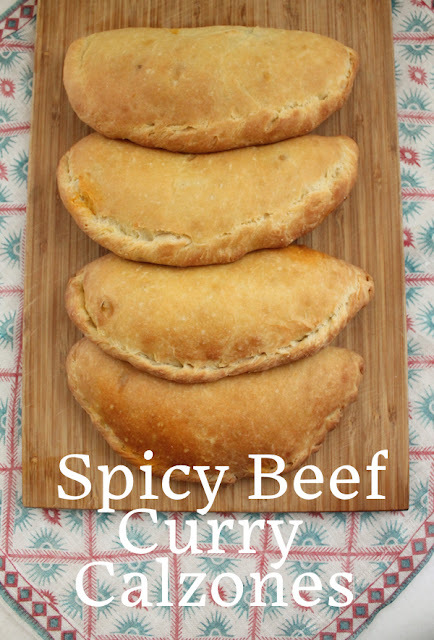 If I can be honest, I was sorely tempted to call these guys Spicy Beef Curry Naan-zones. But I was afraid no one would know what I meant. 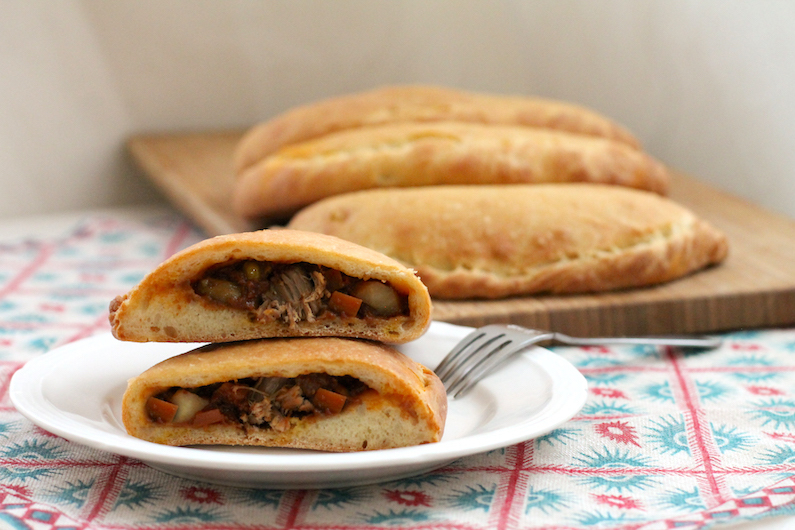 Sure, I could have made a calzone with a more traditional Italian filling, as some of my fellow bloggers have done - and they all sound delicious! Make sure to scroll to the bottom of this post to see the list. But everything you see on this blog is made in my kitchen and consumed by my family or friends. (And occasionally the folks at my husband’s office.) And I really, really felt like eating curry! 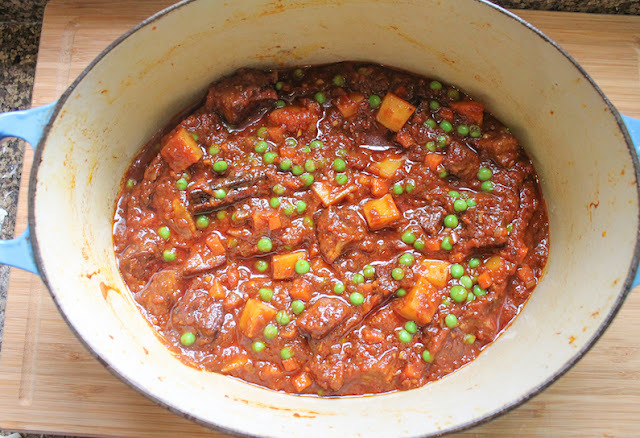 Nothing fancy about the spicy beef curry, except the addition of carrots and peas because I love the pops of color in the deep red sauce. (And we should all eat more peas.) 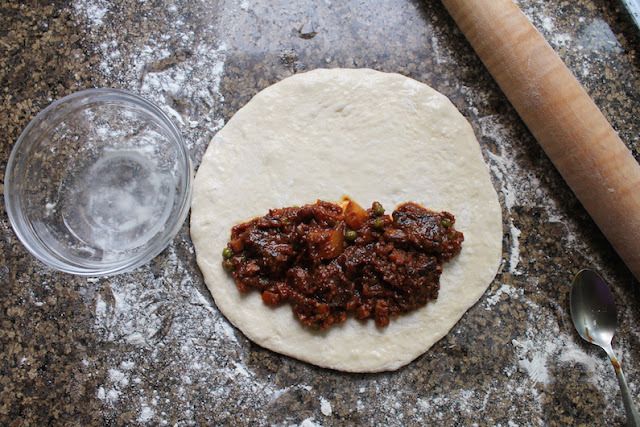 The outer bread itself is made by adapting my favorite naan bread recipe so this is a traditional combo, just put together in a non-traditional way, probably offending both Italian and Indian mamas. I'm sorry (not sorry) they are so good! 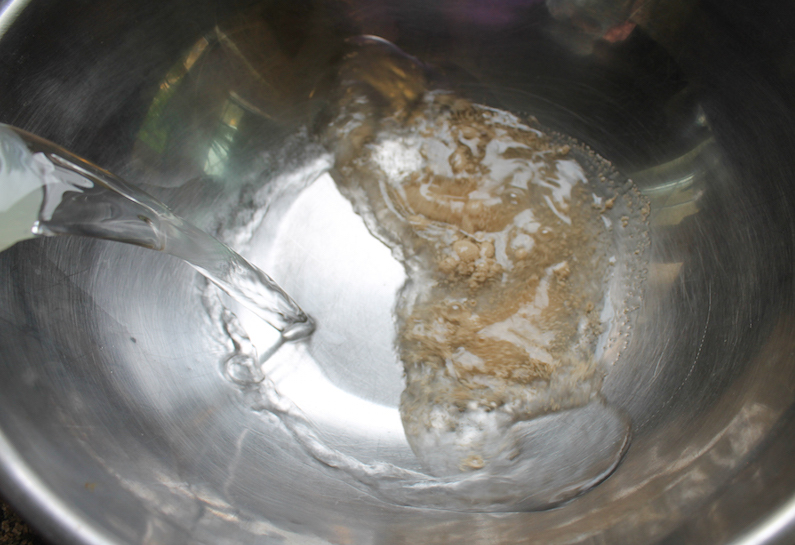 Heat a lidded frying pan over a medium heat and add the ghee or oil. 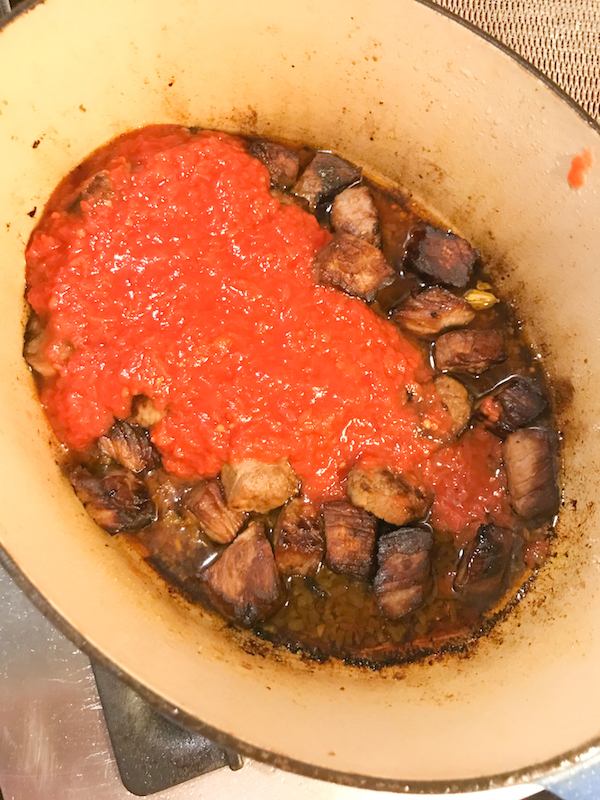 Fry the meat cubes in batched until lightly browned on all sides, then remove from the pan with a slotted spoon, cover and set aside. Add the spices and fry for 1 minute making sure you just toast them. Don't let them burn! Add the onion and garlic to the pan and cook over a low heat until soft. Return the beef to the pan, add the can of tomatoes and bring to the boil. 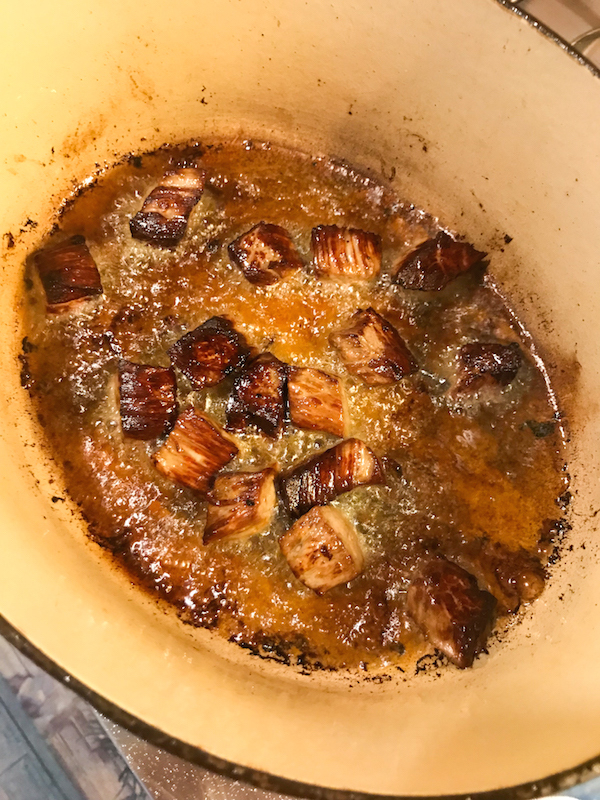 Turn the heat down and simmer, covered, for about 1 hour, or until the meat is tender. Add the potato and carrot about halfway through the cooking time. Right at the end, add the peas. Season with salt and sugar to taste when done. Set aside to cool. 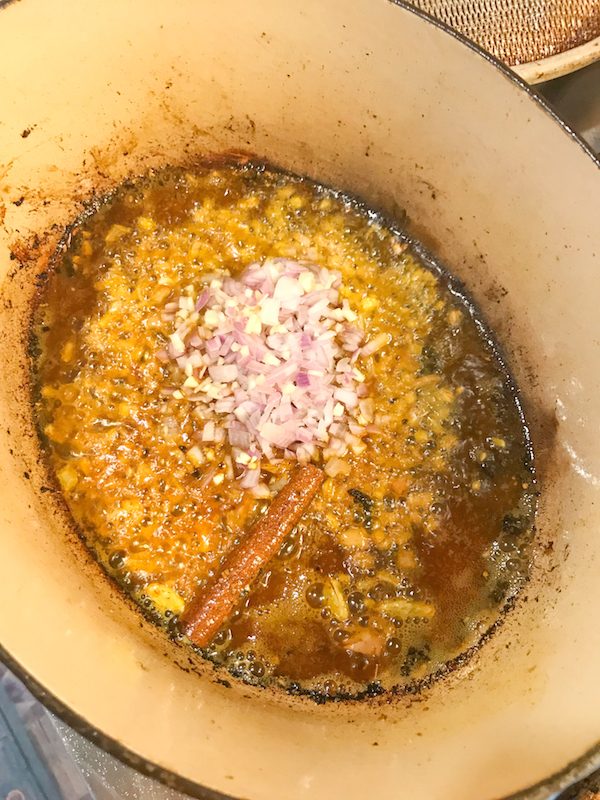 Once cool, fish through the curry and remove the cinnamon stick, if using, and cardamom pods. No one wants to bite into them in the middle of a lovely calzone. Meanwhile, get on with making the naan dough. Stir in the rest of the sugar, milk, egg, salt, and enough flour to make a soft dough. You may not use all of the flour. 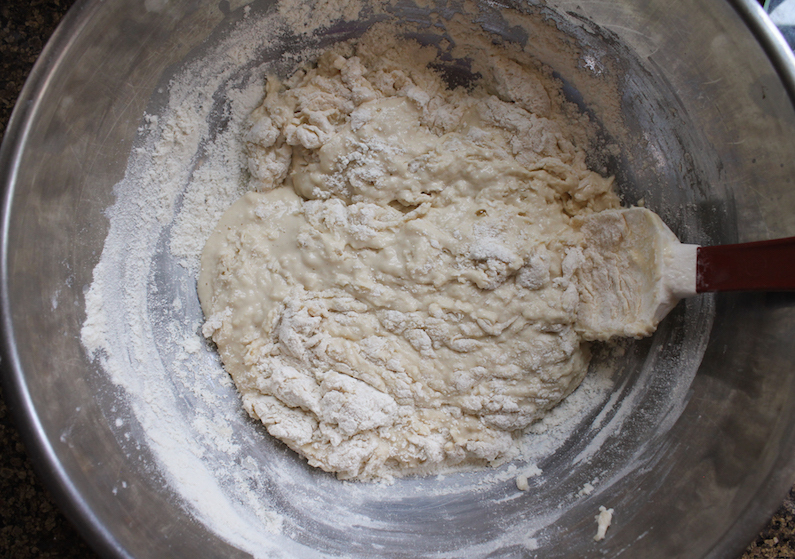 Knead for 6 to 8 minutes on a lightly floured surface, or until smooth. 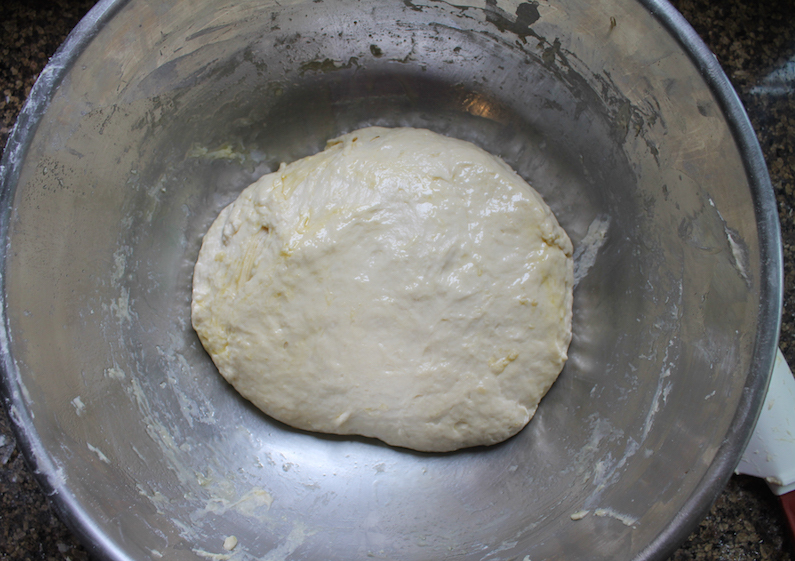 Place dough in a well-oiled bowl, cover with a damp cloth, and set aside to rise. Let it rise 1 hour, until the dough has doubled in volume. Punch down dough. Cut the dough into 8 equal pieces. Roll them into balls, and place on a floured tray or plate. Sprinkle lightly with flour. Cover with a towel, and allow to rise until doubled in size, about 30 minutes. Near the end of the second rising, preheat your oven to 375°F or 190°C and line your baking pans with baking parchment or silicone liners. 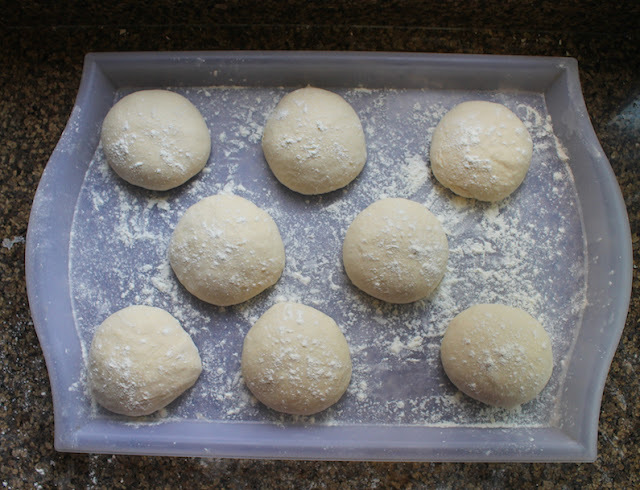 Roll one ball of dough out into a thin circle about 8 1/2 in or 22cm across. Dampen the edges of the circle with water using your clean hands or a pastry brush. Put about 1/2 cup or 125g of cooled spicy beef curry on one side of the circle. Gently lift the other side up and over, pressing the air out as you stick the edges of the two halves together. 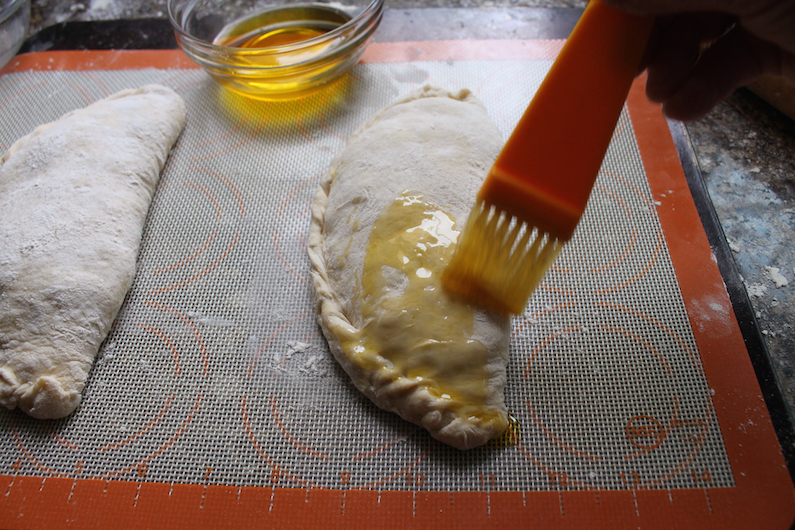 Starting on one side of the semi circle, crimp the edges to seal the calzones. 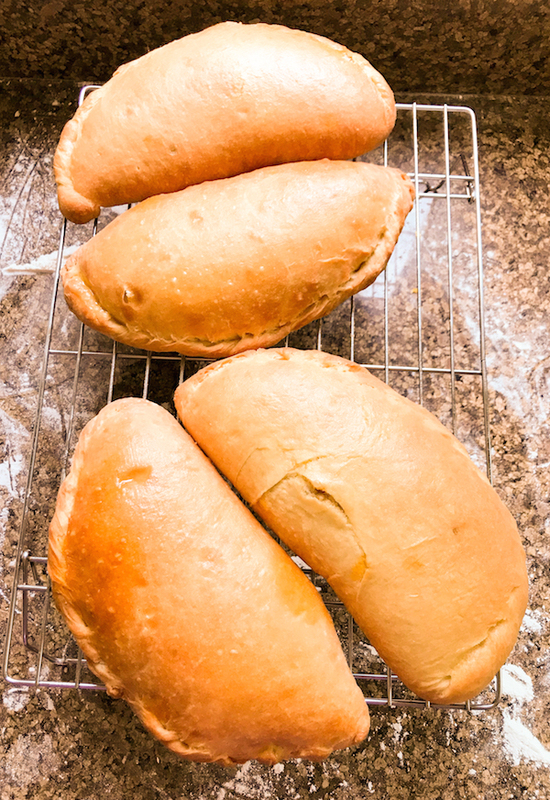 Continue until all of the calzones have been filled and formed. Transfer the calzones to your baking trays, leaving enough room between them so that they can rise while baking. (I was overly cautious and put two to a pan but truly, three would have fit.) Brush the tops lightly with melted ghee or butter. 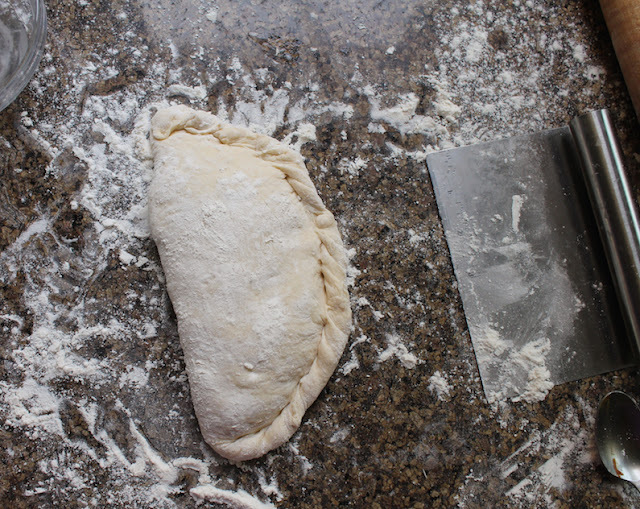 Bake in your preheated oven for 25-30 minutes, or until golden brown and puffed. Many thanks to this month's host (and organizer) of Baking Bloggers, Sue of Palatable Pastime. Check out all the lovely calzones we are sharing this month.